With the main antenna arrays now complete, we are now concentrating on getting the data processing equipment set up. One of the major components of this is the computer system that will perform the de-dispersion calculations. Dispersion is a physical phenomenon where the signals at different frequencies travel at different speeds through a medium. In our case, lower-frequency radio waves travel through the interstellar medium slower than higher-frequency radio waves. In order to add signals together (for example to analyse the pulses from a pulsar), one must first apply a correction for the dispersion that occurs. Although it is possible to estimate what the dispersion will be, based on our knowledge of the Galaxy, ultimately one has to simply try lots of different dispersion measures. That means a lot of calculations, which means we need some pretty high powered, specialist computing to do the work. The project to do this for LOFAR is being led by the University of Oxford on behalf of SEPnet. 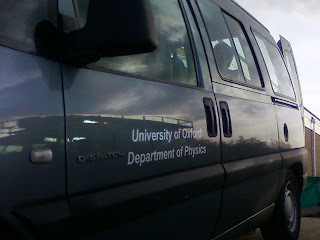 Caption 1 : Dispatch from the University of Oxford. 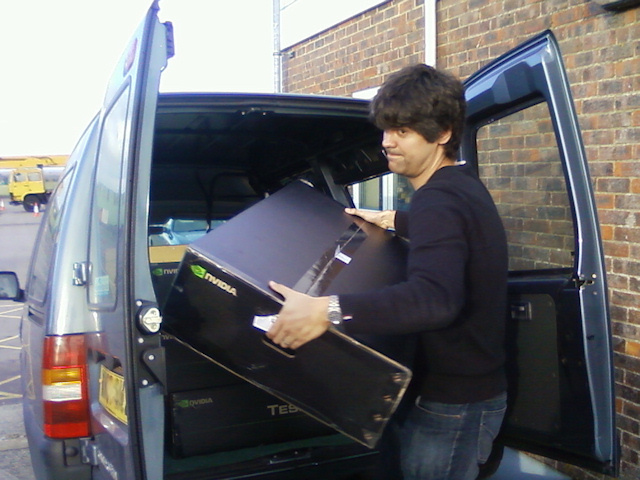 Caption 2 : Aris Karastergiou unloads another GPU-server from the delivery van.